A conversation with some friends had me sharing out an old piece I had written about online reading comprehension. 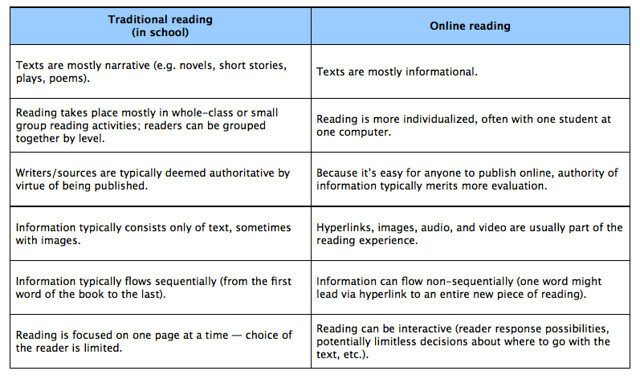 Much of what I learned about how kids read with screens comes from the folks at the New Literacies Institute (some of whom are still in my orbit — Ian and Greg). In that article, I had created this chart with help of other folks through some crowdsourcing, and mostly, the chart still holds up. You can read the piece over at the Learn NC site. 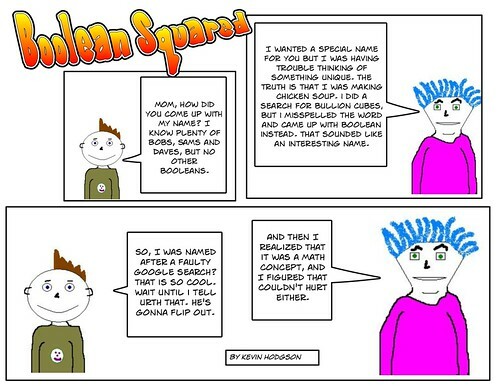 Thank you, Video Amy (from Edutopia), for sharing out your collection of videos that poke fun at standardized testing. We’re in a little lull right now — we’re past the ELA state test and next week, we move into Math — but these videos lighten the mood a bit. I’ll be sharing this collection with my colleagues. 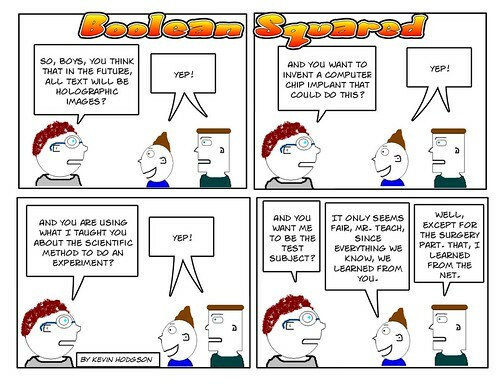 When I was doing my Boolean Squared comic, I had a storyline about testing in education, too. 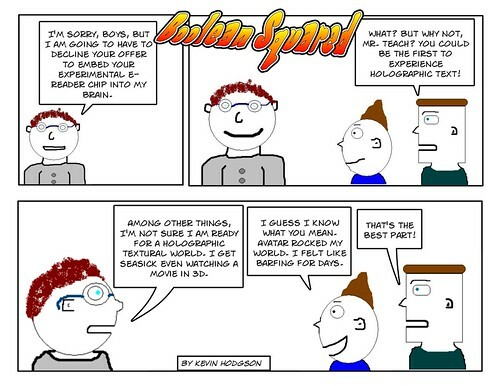 Here is one of the comics from that story. Anyway, you have to find ways to laugh, right? A movement underway called Save our Schools (SOS) seeks to remind our elected officials that public education is crucial, important and worth saving. There was a rally this week in Washington and a blogging effort out of the Cooperative Catalyst collaborative blog space is underway. They are asking bloggers to write about public education and then link to their site. The hope is to show support for public education in a myriad of ways. I thought about writing something serious, such as my feelings that public education touches more lives than just about any institution in our culture; about how public education does more to equalize opportunity than other other program in the private or public sector; that public education seems increasingly under attack from the government we turn to for support. You know … serious stuff. But I imagine all that is being said, so then I figured, why not add a little levity. 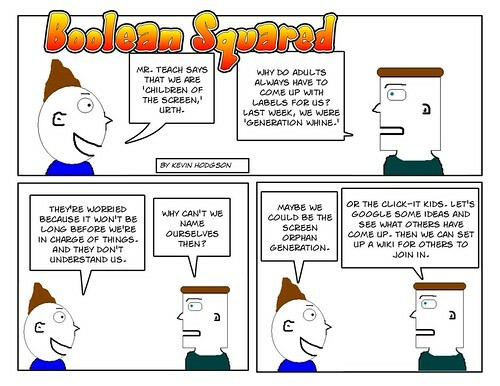 So, here are a series of Boolean Squared comics that I had created around standardized testing, which has become the hallmark and lodestone of so much of educational reform. 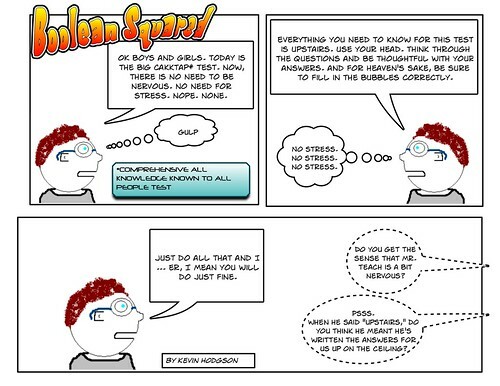 I have mixed feelings about the testing (the data is useful, the carrot-stick approach is stressful) and I hope that gets captured a bit with these comics. A participant in our Western Massachusetts Writing Project Summer Institute asked me to help her find some resources for a project that she hopes to do this year, using fake Facebook sites with her students to create posts for characters from various novels. She also wondered if there was a place to do this where kids (as literary characters) could interact (in character). That gives the idea a little wrinkle. WordPress — another free blogging platform. 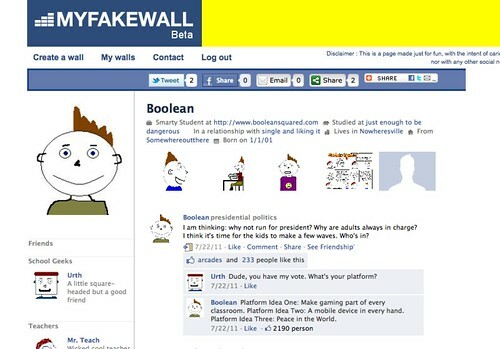 Fakewall — it is designed to resemble a facebook page but it is not real. http://www.myfakewall.com/ Looks interesting to me. I hope that all helps. I’d be interested in knowing how it goes for you. If you are at the University level, the Ning platform would be the way to go, if you want my opinion. You could also use some of the Fake Facebook Templates and then embed them into Ning, where conversations could take place. I found Fakewall very easy to use, and it seems like a simple way for a teacher to bring the concept of social networking around literary characters into the classroom setting. The only downside is that others cannot comment on a page, so the entire fake page is really the work of one person. I am reading The Information by James Gleick (it’s good), which maps out the history of ideas around information flow, starting with ancient writing. I came to a section last night that stopped me in my tracks, because it was all about George Boole. He revolutionized the philosophy of logic, and his Boolean Logic ideas are still at the heart of computer programming (the 1/0 system of data). 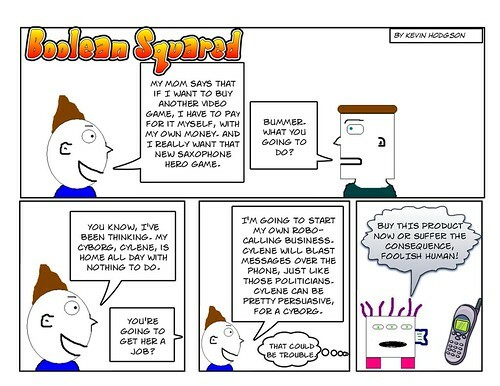 This is the second in a series of comics about Boolean’s cyborg, Cylene, taking on a job of robo-calling. In this case, I have Cylene working for a political candidate. 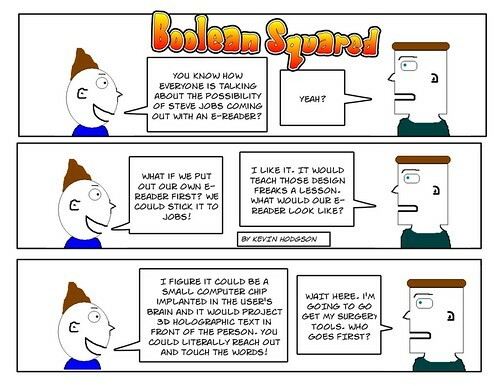 Boolean Squared: Get a job, kid! During our last tumultuous here in Massachusetts (ie, Republican Scott Brown), our phone was overwhelmed with robo-calls. Every hour, it seemed, we were getting some recorded voice, touting the candidate. It got so bad that we didn’t even want to pick up the phone. My students were complaining about the robo-calls at their homes. It was nonsense. 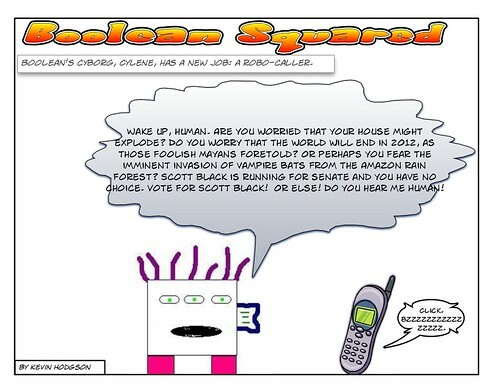 Which makes it a good topic for my comic strip, as Boolean decides to enlist his cyborg, Cylene, in some daytime robo-calling to earn some extra scratch to buy a Saxophone Hero (hey, if guitarists and DJs can have their own Wii game, why not us saxophonists?). 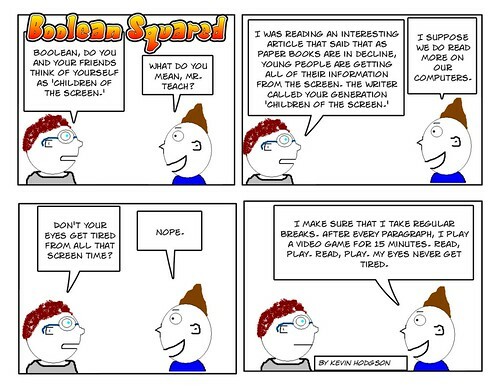 This ends the last comic in my series of the prank pulled on Mr. 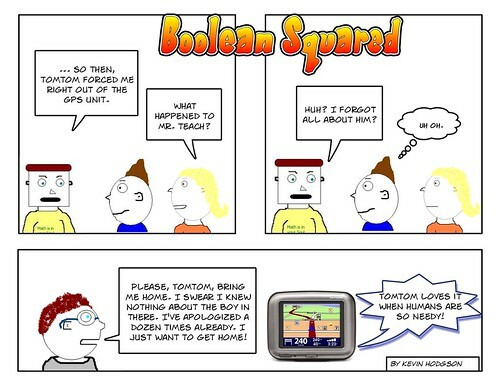 Teach and his GPS unit. Urth comes home but Mr. Teach still needs directions from a machine with an attitude. 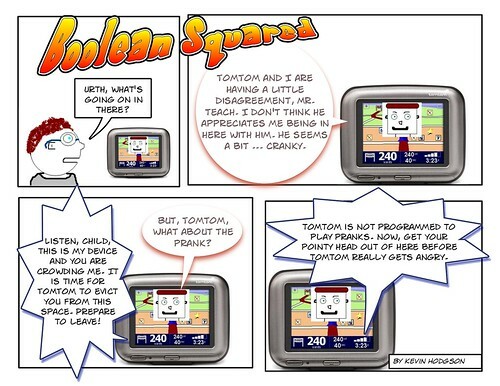 Today, on Boolean Squared, Urth clashes with TomTom inside the GPS unit.